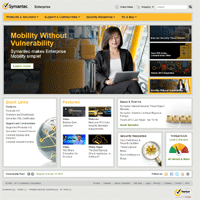 Symantec is a public company that offers SSL certificates, and other computer security products. It purchased the security business of VeriSign in 2010. It is currently the largest SSL certificate provider, owning both GeoTrust and Thawte. Its Website Security and related PKI solutions were acquired by DigiCert Inc. in 2017. The Symantec SSL certificate reviews listed below will help you determine whether Symantec is a good company to buy SSL certificates from. The reviews have been verified to be from real Symantec customers. If you want to compare Symantec SSL certificates with certificates from other SSL providers, use our SSL Wizard. If you have ever purchased or received a certificate from Symantec, please post a Symantec SSL review to let others know what to expect. they will give you a cert for anything, even google. No question it's a brand and name you can trust and so can your customers. For that reason alone we chose verisign / Symantec, despite the price tag being a little excessive. Although pricey, this brand helped build and maintain trust in doing transactions online at a time when people were not sure about online security and privacy (2005-2013). 2015, I still trust this brand but would hope it is more competitively priced.. If it is, definitely worth considering. Look elsewhere. Symantec is and always was a horrible company with bad products they rush to market before they are ready. Way too expensive for my requirements. If I were securing a multi million Â£ transactional site the name of Verisign/Symantec maybe worth a premium. Thier company authentication procedures are I'm sure excellent. However for a wildcard to secure messaging platforms an initial quote of Â£40k was a bit steep. Sales 'worked hard?' to lower this and we got something around the Â£8k mark quoted after a day or so. Went elsewhere for 2k. Changing the computer after Microsoft Authenticode Code Signing Certificate request caused problems. The representative was not exactly aware about the solution but was very helpful and solved the case efficiently. What a rip off - non-www not included! Whilst most other SSL certificate providers will include both the www and non-www domain (even the $5/yr ones), expensive Symantec do NOT. You are forced to buy a VERY expensive wildcard certificate. Symantec/Verisign/Norton NOT recommended. I would however recommend ssls.com for their level of support. Symantec pre-sales and post-sales representatives have provided us with the best of quality in services and recommendations towards the selection, deployment and support for our SSL certificates. I've got several calls from Symantec employees (Ireland and Belgium) explaining de steps I needed to take. This personal approach is something seldom seen at companies. The Symantec staff helped me get the SSL up and running. Excellent! Their was some confusion about the judicial name our company uses and the name of the owner of the website, but that was sorted out within a day thanks to the initiatives of the employees of Symantec. No hassle and waiting from my side, no filling in of service tickets. The salesperson will hand hold you through the entire process. Support can also walk you through the request and install of the certificate. Symantec is good about giving you advance notice when you need to renew and also walking you through that. I started shopping around as our current code signing cert is about to run out. I found loads of other, less expensive options - like Comodo. When I asked why Symantec is so much more expensive, I was told, "we're simply the best!" When I asked to explain the specific attributes that lead them to that claim, I couldn't get an answer. Sorry, but for something that just says the code author is who he says he is, I'm lost as to why one spends 4+ smackers. I have been a long time customer for Symantec. Recently I needed to order a new bacth of certificates. Just like before - Symantec's service was excellent, quick and proactive. We have had the code signing certificate from VeriSign for many years. But this year we have failed to renew it with Symantec. Because the Symantec was unable to verify our new organizational contacts. We have provided the fully notarized legal letter, but they are unable to contact the goverment to check the status of the laywer!!! The phone lines are busy (surprisingly). So the overall rating is "The Worst". Organization: Hudson Gateway Association of REALTORS, Inc. There is no company I trust more or that is better than Symantec. Period. Always adding new features to jack the price up.. I have several software products that I have recently signed with an EV Certificate from Symantec. It certainly isn't cheap but the cost is worth it. The installation isn't too daunting, but I did need some coaching from their support staff, and in this I was 100% satisfied. The phone was answered quickly, the person actually listened to me explain my needs, and patiently guided me through the signing process. Now users downloading my demo software don't get those dire warnings of what might happen if they install my products. The customer service group and technical group know what they are doing and are willing to help you out in a time of need. If you are not sure how to do something they will have the answer. They make the whole process easy. The whole process was smooth, efficient & quick. I had tried to purchase a certificate from one of your cheaper competitors & ended up cancelling the order after a week [without having the certificate issued!]. After I spoke with your rep I had the certificate issued & installed on my server in under 3 hours.